Durable thermally fused laminate work surfaces feature superior resistance to scratches and stains. All work surfaces and leg end panels are 1" thick. Accepts Universal or Articulating Keyboard Tray or Pencil Drawer. 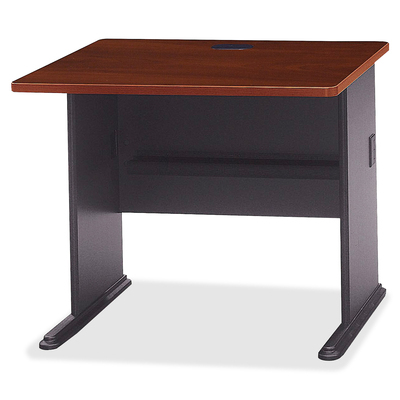 Customize your Desk with up to four Mobile Pedestals, and Hutch to increase storage and versatility. Wire management system provides desktop and leg grommets. Sturdy molded ABS feet with steel inserts include adjustable levelers for stability on uneven floors. Series A Collection Desk with versatile C-Leg table design permits easy configurations. Constructed with 100% thermally fused laminate for durability and superior resistance to scratches and stains. Integrated wire management in the desktop and leg grommets conceals cables to keep your desk area uncluttered. Customize your desk with up to four Mobile Pedestals, and Hutch to increase storage and versatility. Expand your office area to create L- and U-Shape worksurface, plus this desk can stand alone. Compensate for uneven floor surfaces with adjustable levelers.